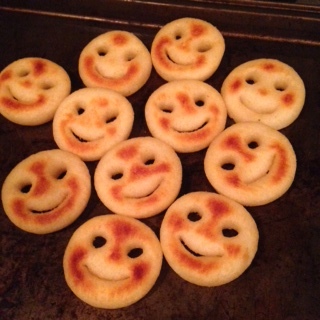 “The kids are going to love these,” I thought to myself as I picked up a bag of smiley fries. I am always looking for creative ways to present food and this was a no brainer. I couldn’t wait to serve them up. Perhaps we went to Home Depot a few too many times but Arianna is simply obsessed with tools. 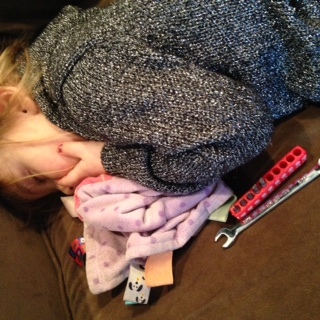 Everywhere I go, there are screwdrivers, nuts and bolts, hex wrenches, and nails…teddybear who? She has even been sleeping with these comforting metal friends. Strangest thing, right? The more I thought about this, I realized that this was quite a money saving situation. “Hey kids, want to get a treat!” We’re going to the hardware store! Never mind toys, nails and washers are like 25 cents a piece. Ever watch one of those cop shows or movie thrillers where one of the characters is a major psychopath. His hideout has a wall completely filled with people’s eyes or something like that. 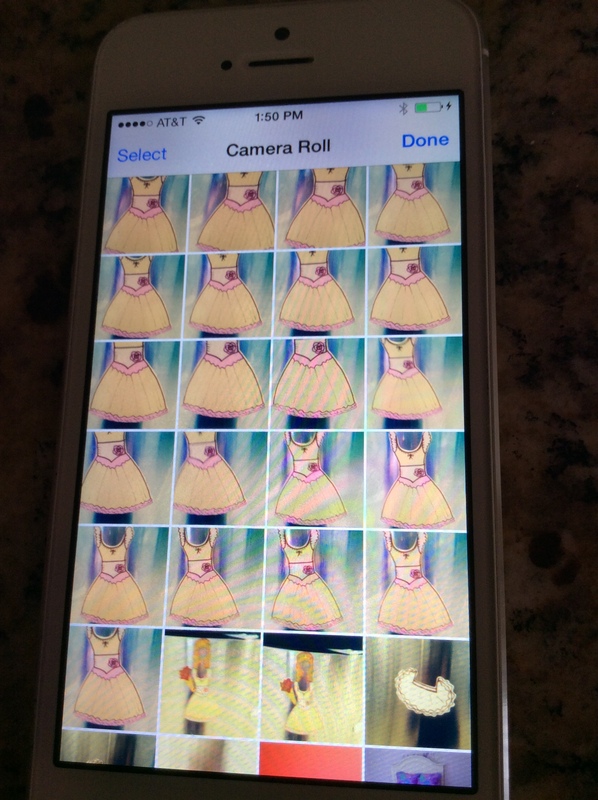 Imagine my horror when I picked up my cell phone, went to look for a picture, and ahh- hundreds of pictures of Ruby! And, as if that wasn’t enough, hundreds more of this magnetic doll. My goodness, obsessive child I have! Ok, let’s make this work for me, I thought to myself…clearly, the girls love taking pictures so next time we’re bored, we’ll take pictures of anything, our stuffed animals, other people’s mailboxes, odd holiday decor on neighboring houses…we can develop them and create photo albums. You can find cheapy albums at the dollar store. They can have their own collection of 100 pictures of “Mr. Bear, Stephanie, the unicorn, and whoever else.” Leave it off my phone! For the past two weeks, Arianna has been asking for a banana- Gia eats one as often as she can – she is part monkey, I swear, always climbing on the counters and eating them. I figured little sis was just following in her footsteps but it turns out, she just enjoys peeling them and throwing the peel and the banana in the garbage! I thought it was just a one time thing until I noticed she was doing it every day. 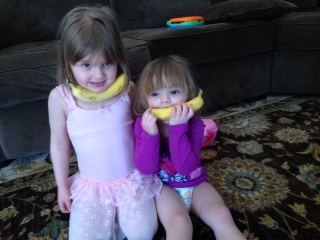 “Ari, why are you asking for bananas when you don’t like them?” I asked. Ok – so the girl has a thing for peeling bananas, she just likes to peel…this is really going to come in handy for me- I see a future full of silver surprises – “Come on Ari, put the toy doll down,” I have a treat for you. 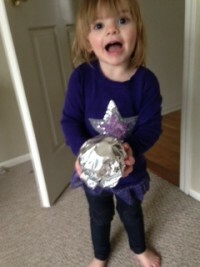 Flash her an aluminum wrapped anything. I’ll just regift from my own house! So happy to get this present. “Wow, this is awesome, a new ball,” she said excitedly…I literally just picked this up from the basket of toys in our family room. 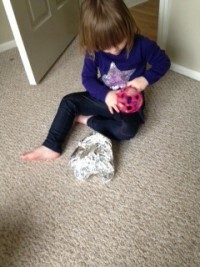 Anyone else have any kid’s odd behavior to share? Hi! Funny, I gave that ball back to Michelle!